Giant Bk More Str Spor is for Young Adults. Giant Bk More Str Spor was written by Howard Liss. Giant Bk More Str Spor was published by Random House Books For Young Readers. 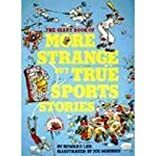 Subjects of Giant Bk More Str Spor include Anecdotes, facetiae, satire, e, Anecdotes, facetiae, satire, etc, Children: Grades 4-6, Children: Young Adult (Gr. 7-9), General, Juvenile literature, Juvenile Nonfiction, Non-Classifiable, and Sports.